The detailed release notes follow. enter the input text as if there was no completion. exit with C-u C-j (forwards to ivy-immediate-done). This time, they are jabber-chat-mode and elfeed-search-mode. You can launch a query replace with M-q from swiper. By default, ivy completion candidates are sorted with string-lessp. The sorting can be customized with ivy-sort-functions-alist. While refiling, the natural order is actually best, so the sorting is turned off in that case. With ivy-mode you can select a file anywhere on your file system by switching directories repeatedly with C-j (ivy-alt-done). After moving to a new directory, the point should be on the first candidate. All this time there was an issue with the face order swapping between 1 and 2 groups. This is now fixed. Also, I've made swiper-match-face-4 inherit from isearch-fail. It's important to have all 4 faces be different. When the current input is a bad regex, just display no candidates and continue. Don't throw an error. While completing file names, you can enter // to move to the root directory. This change was necessary in order to make it possible to enter e.g. /sudo: or /ssh:. This feature is a bit flaky for now. But it works well on my machine. It should get better after a few bug reports. You can start the completion right after the method, e.g. /ssh: RET, or after method+user, e.g. /ssh:[email protected] RET. If you set confirm-nonexistent-file-or-buffer to t (it's nil by default), you'll have to confirm when you create a new file or buffer with ivy. Just some extra polish to make things look nicer. The buffers to which you're connected through TRAMP will be highlighted with the new ivy-remote face. While completing, you press M-p to select the previous input. This update tries to select not just the first candidates that matches, but the actual previous candidate that you selected before. This is only relevant for when the completion candidates have custom face backgrounds. But in that case, the minibuffer looks a lot nicer. Press TAB to do call ivy-partial-or-done to complete the current thing to the largest possible prefix. When called twice in a row, it's the same as C-j, i.e. it will finish the completion. In Emacs, hidden buffer names start with a space. 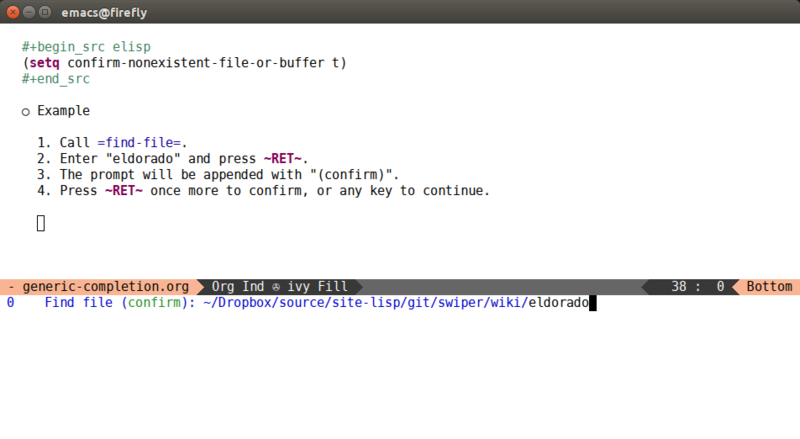 To see them all, press a single space while completing buffers in ivy-mode. You can toggle between hidden and non-hidden buffers by editing the first space in your input query. Remember that with ivy-mode the minibuffer is a proper editable area, so C-a works properly (unlike in isearch or ido-mode). Spaces are wild while matching - they serve as group boundaries. However, sometimes it would be useful to quote them. From now on, you can quote N consecutive spaces by inputting N+1 consecutive spaces. This is actually a really cool feature, so if you're paying attention to any section, let it be this one. For example, I cloned boost-1.58.0 and called counsel-git, which is like a find-file for all files in a git repository at once. Initially, it gives 45919 candidate files. With input "utility", there are 234 candidates. With input "utility hpp", there are 139 candidates. with input "utility !hpp cpp" there are 57 candidates. with input "utility !hpp cpp ipp" there are 46 candidates. I can unify the regex to "utility ! [hic]pp" and also get 46 candidates. exclude htm with "utility ! [hic]pp htm" to get only 17 candidates. You can use this strategy anywhere, not just for git file. For example, in describe-function or swiper. You can customize ivy-re-builders-alist to make ivy-mode complete in the way that you like. The alist dispatches on the collection type, so you can have one completion strategy for buffers, another for files and still another for everything else. the ones that should match (will be joined by and). the ones that should not match (will be joined by or). This feature is still a bit of a work-in-progress. But it allows you to resume the last completion to the point before you entered RET or C-g etc. It only works for features that specifically passed :action to ivy-read. You could resume other features, but nothing would be done when you select the candidate, since ivy-completing-read has no idea what the function that called it was going to do with the result. The ivy-resume feature adds occur-like functionality to swiper. Calling ivy-resume is like switching to the *Occur* buffer. Big thanks to all who contributed, especially @tsdh and @zhaojiangbin.